Parents whose children take dance classes will be well aware of the costs of children's dancewear. While there are some other activities whose equipment is even more expensive, dance equipment is quite expensive. Although the equipment is pricey, there are a few basic pieces that should be of high quality if you want them to last. Shoes are one of the most important elements of a dancer's arsenal of equipment. While most dancers can dance in almost any type of clothing (although there are certainly traditional pieces of dance clothing), it is quite difficult to tap dance without tap shoes or do ballet en pointe without pointe shoes. Luckily, children's dancewear, when it comes to shoes, are significantly cheaper than the adult versions. Children's tap shoes and ballet shoes can usually be purchased for around $20; adult tap shoes easily cost twice that much, and pointe shoes cost at least three times that much. So despite children's dancewear being expensive, the expense is minimal compared to adult dancewear. Children's ballet shoes are usually pink leather or canvas for girls and black or white for boys. Tap shoes are almost always black for both girls and boys. It's because the children's version of these shoes are so simply styled and technically less advanced than the adult versions that their prices can be significantly lower. Apart from the shoes, children need a small amount of specialized clothing in order to participate in dance classes. While the clothing is not actually necessary, most dance schools make children adhere to a strict dress code in order to take classes at their studio. Many studios require that girls wear black leotards and white or pink tights in order to come to class; the boys' dress code is sometimes more flexible, but large studios often require black tights and a white t-shirt. Little girls, although they absolutely love tutus, usually have to refrain from wearing them in class because most studios do not allow them. Whether you are looking to buy dance shoes, leotards, tights, or costumes, there are several dancewear companies that offer children's sizes. For both clothing and shoes, Capezio is a classic brand. In addition to shopping specific brands, there are several websites that offer discounted prices on dancewear either because the items are going to be discontinued or simply because they do not have a physical shop, and therefore the costs associated with keeping a shop are eliminated. Such websites offer a range of slightly discounted dancewear; when these websites offer items on sale, the price cuts can be very significant. 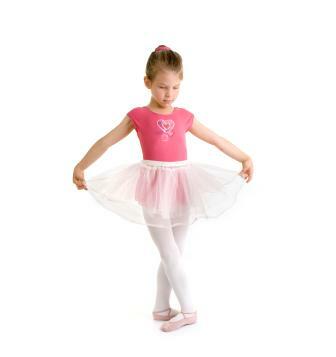 Dancewear Solutions has a considerable children's dancewear selection. Dance4Less usually has a considerable clearance section on their website. All About Dance has an extensive collection of children's dancewear, especially leotards, some of which are pretty enough to be considered as costumes for a recital instead of splurging on expensive costumes. Children's dancewear items can also be purchased at general websites such as Amazon. If you are looking to simply purchase a black leotard and have other purchases to make, such as a blender or a book, Amazon offers convenient shopping. For children's dancewear that is a bit more specialized, you may or may not find what you're looking for on a general website.When buying children's dancewear, shopping online is not usually a problem because as long as you use the sizing charts to determine what size to buy, the clothing is likely to fit. However, if your daughter is getting ready for pointe shoes, know that this is always an item that needs to be fitted by a professional in a dancewear store. Likewise, heeled dance shoes should be tried on for size. Although most dance studios have a set dress code, know that your daughter will most likely be enthralled by dance costumes and frilly tutus, so even if these are not dancewear items that your child can wear to class, you might want to indulge in a few. Your daughter will only get to wear them around the house, but if you're lucky, she'll put on some impromptu shows for you in the living room!